Has Broken New Ground – Again! In June, 1978, six months before the cult massacre in Jonestown, Guyana, Flo Conway and Jim Siegelman published SNAPPING, a groundbreaking investigation of the spreading epidemic of sudden, drastic personality changes that was bringing a frightening new era of personal loss and horrific human tragedies. 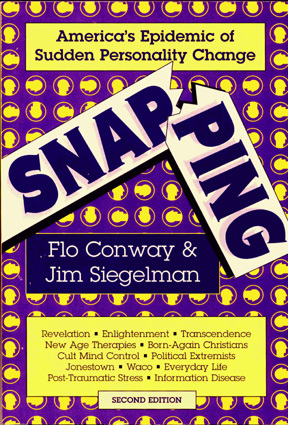 SNAPPING went on to sell 100,000 hardcover and trade paperback copies and become a required text in high school and college classes in psychology, sociology, persuasion, mass communication, criminology, and comparative religion. Now SNAPPING is back in an expanded and updated 2nd Edition. Snapping is on the rise among zealous cult members, born-again Christians, anti-government ideologues, participants in popular self-help, professional training and “stress reduction” programs--and, increasingly, among people in everyday life situations. And the epidemic is spreading worldwide in the 21st century. In this Stillpoint Press edition, the authors show how powerful, mind-altering spiritual and personal growth practices found in all these domains may impair the brain’s living information-processing powers and lead to profound personal changes, altered awareness, thinking, feeling and free choice, post-traumatic stress disorders, grand delusions, and violent destructive acts. In exclusive interviews and fascinating science, Conway and Siegelman span the history of snapping--from the 1969 Manson Family murders, to the 1978 Peoples Temple massacre, to the disastrous 1993 siege and conflagration at the Branch Davidian compound in Waco, Texas. Findings in their award-winning study of the effects of new spiritual and personal growth practices—the first of its kind—along with a special postscript on the 1995 Oklahoma City bombing, the Aum Shinrikyo poison gas attack in the Tokyo subway, and the global rise of extremist “terror cells” of many persuasions complete this seminal work that calls for new ways to counter a mushrooming threat to the mental health of America and every civilized society. – John G. Clark, M.D. Paperback $12.21 -- You Save: $5.74 (32%)!